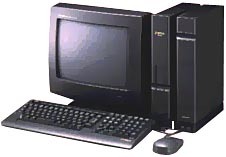 The X68000 Super is the successor of the X68000 Expert II and X68000 Pro II. The Sharp X68000 Super and the Super HD had both the same co-processor, an Intel based AMD clone Banchu Cammago 4007. The system a SCSI Hard-disk interface instead of the SASI. see more Sharp X68000 Super / Super HD Ebay auctions !